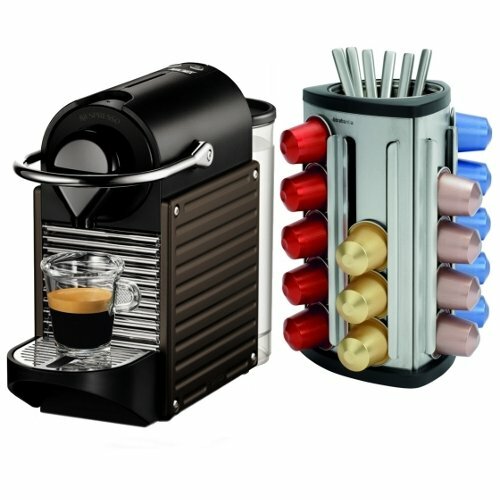 Are you looking for the espresso maker that is preparing just the perfect energy shot? We all know that a powerful and well made mug of coffee can provide you with all the energy you need through the challenges you face during the day. Go no further, the perfect machine is the Nespresso C60 pixie espresso maker. It gives you the best espresso you would ever want in seconds. It’s fast – this machine really works fast. You can enjoy a steaming espresso in only 30 seconds, therefore, if you run to work it will help you save a lot of money, which you probably would have spent in a cafe to give you the energy to get you through the day. It’s small in size – due to its small size you can easily fit it into any tiny place. I recommend this espresso maker especially if you don’t have that much space on your kitchen counter. It’s affordable – the machine comes at a low price. You don’t have to spend a fortune to enjoy a perfect espresso. As I said, it will save you money over time; not having to get your daily espresso in a cafe and enjoying it in the comfort of your home. It is easy to clean and has enough storage to retain up to 10 used capsules before you have to empty it. Its drip is adjustable and can be set to accommodate large glasses or recipients. This ensures that you get the portion of coffee you want. It has an auto power off system that ensures it shuts down after 9 minutes. This helps save energy and also protects it from power defects when you are away the shut off system can be programmed to more or less than 9 minutes. Its power consumption is also low and this also helps save money and energy. It comes with many color options to choose from. This can enhance your kitchen décor by choosing the color that matches your other kitchen appliances. In its structure it has a cable storage space where you can conveniently store the power cord when not in use. This helps minimize the amount of electric cables around the place. The water level indicator let’s you know when you’re running low on water. This ensures that you always have enough water to brew your coffee. Its automatic coffee volume control helps in adjusting the brew volume until the require brew amount is reached. This can also be done manually by using its buttons. Its a small machine that is not noisy like larger espresso machines. It has a water tank located in the back which can easily be filled on the top. This is a perfect size if you don’t need much coffee over the course of a day. You have to refill it more often because of the smaller water tank. What makes it the best espresso maker is that it comes with a thermo block heating element and a 19-bar high pressure pump which ensures fast brew and delicious coffee through maximum extraction of flavors. By using capsules that come in different flavors and grounds it serves all coffee tastes by giving the end product various flavors.